JERUSALEM, June 7, 2013 – Women For the Wall, a grassroots organization committed to preserving the sanctity of the Kotel as a place of prayer and Jewish unity, calls upon all women who treasure Jewish tradition and the unity of the Jewish people to participate in a peaceful prayer service at the Western Wall, on Rosh Chodesh Tammuz, Sunday June 9 at 7 AM. 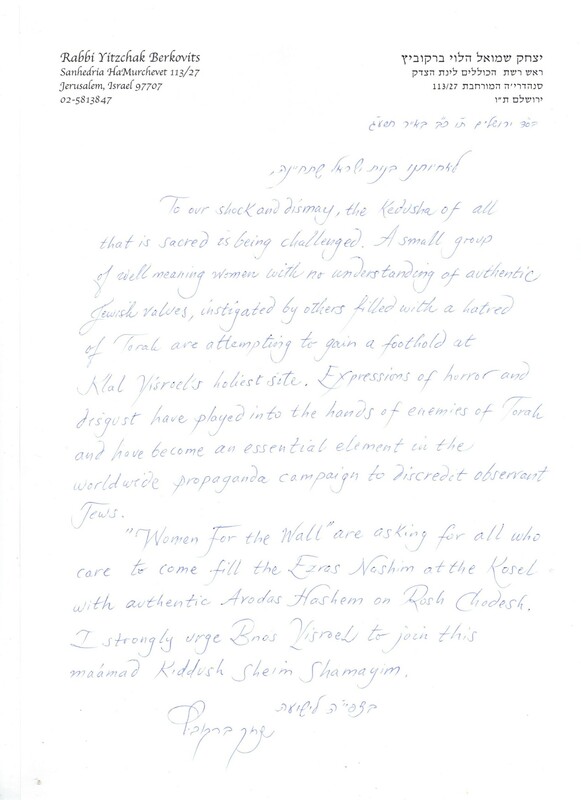 Women For the Wall have caught the attention and endorsement of Rabbinic authorities and Jewish leaders from across the spectrum of Israeli religious life. 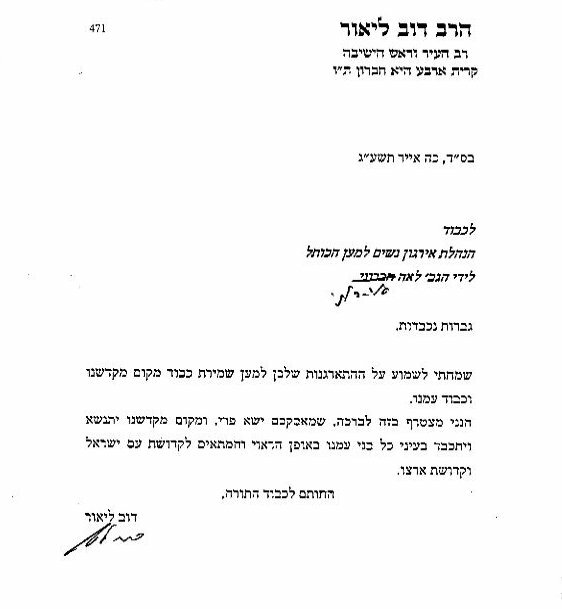 Most recently, Rabbananit Tzivia Eliyahu, widow of the late Sephardic Chief Rabbi Rav Mordechai Eliyahu zt”l, said that it is necessary to prevent “disgracing the Holy Site” and called upon the Women Of the Wall to cease their deliberate provocation. Women of the Wall led by Anat Hoffman of the reform movement, have stepped up their activity in recent months, going so far as to call for turning the Western Wall plaza into a “national monument” devoid of religious symbols. Most recently, and after claiming to desire to “reduce the tension,” they have declared their intent to come to the Wall with a Torah scroll, violating site regulations and once again risking arrest. All women able to join Women For the Wall for quiet and peaceful prayer at the Western Wall are invited to join them at 7 AM, Sunday morning June 9, Rosh Chodesh Tamuz on the Hebrew calendar. For those unable to be present in person, live video links will enable women to join them in prayer at that time. Links will be posted from the website, http://womenforthewall.org/ . WOW says they are a a peaceful group and they simply desire to pray at the Kotel. They claim it is the Charedim who are uncivil and persecuting them. According to Mrs.Ahroni Women4theWall tried to get together and speak to them. WOW refused. That speaks volumes about WOW. On one hand their spokesperson, Ms.Sacks smiles to the international media and says she is thrilled to see so many women at the Kotel. But when there are no cameras it is a different story.They are not even decent enough to sit down and talk woman to woman. In my opinion the reason they won’t even speak is obvious.For decades they have been telling people there was some sort of war between Charedi men or rabbis against Jewish women.Then 15,000 Jewish women arrive at the scene and tell them that they don’t agree with WOW and demand that the status quo remains.The rug had been pulled out from under WOW’s feet. In my experience people don’t believe something until they see it. Last Rosh Chodesh WOW saw 15,000 proud Jewish women who destroyed their false narrative.The bottom line is even when you have the support of the world media and even when you are flush with cash the truth will remain the truth.Last Rosh Chodesh WOW was exposed.”The jig was up”. Those who claim to be for tolerance and understanding won’t even speak with people who have a different opinion.So much for tolerance and understanding.